There are so many different kinds of Easter candy in the world. However, there are some that are always in my daughters' Easter baskets...no matter what their age. 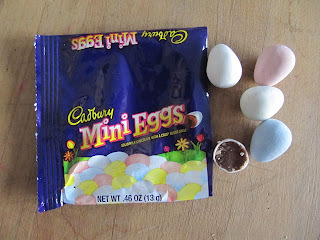 Yummy Cadbury Eggs (hey, who bit that one? )...I think these are always in their baskets, because they're my absolute favorite!! Peeps are definitely in their baskets...not to eat, but to puff up in the microwave. I know this sounds crazy. We've been doing it since they were little. Just a funny little game to watch them blow up like balloons. LOL !! Did you know just a few seconds (I think 10 or so seconds) in the microwave...depending on your microwave...will puff up these little cuties and then they shrink down to nothing. Don't go too long, may brown too much, smell burned and glue itself to the plate like hardened sugar!! This is experience talking. Don't let the kids do this though...adults only! The sugar can get hot. No eating after. Great memories of 2 little girls laughing so hard as the peeps rise up in the microwave. They are 19 and 20 and we still do this! It's a tradition now. Not so many toys any more, now that they are in college, but I still add something fun just for old time sake. What's always in your Easter Baskets? Chocolate eggs and marcipan are into my yellow HEN, and I can't stop eating it. Easter greetings from up in the north of Norway!! Black jelly beans! I know this is a love it or hate it item,but I adore them and have wonderful memories of sharing a bag of all black jelly beans with my Dad every Easter. Has to be Cadbury Mini Eggs, and anything Kinder chocolate, I'm crazy for the stuff! I cannot find Peeps here in the UK. But on Sunday, my Pastor husband will take a huge basket of mini eggs to church and give one to everyone in the congregation! There will be Peeps only for the sake of tradition because I don't think anyone actually eats them except my dad. There are always jelly beans (I snag all the black ones), Reese's peanut butter eggs, mini-Butterfingers for my youngest, Dove dark chocolate for my granddaughters, Starburst for my grandson who cannot eat chocolate, mini-Snickers for my oldest son, little packages I found of Swedish fish with eggs ('cause fish lay eggs, too! 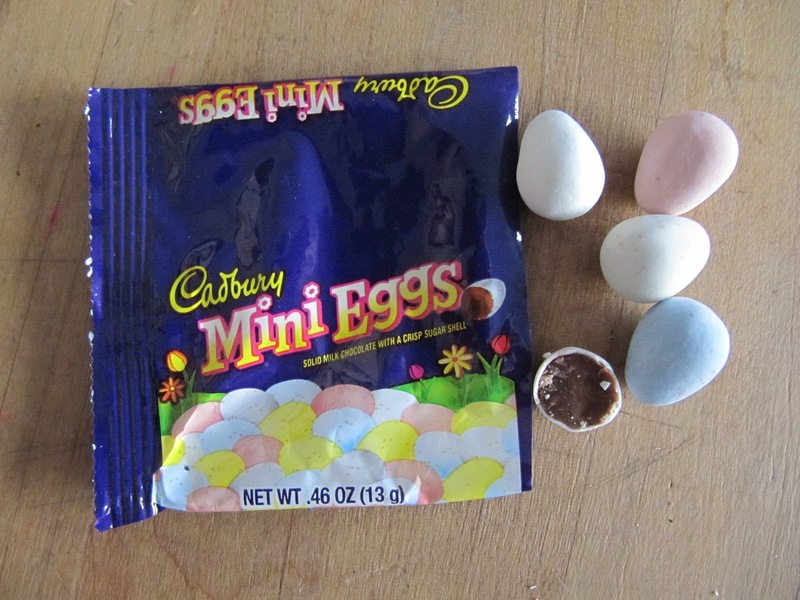 ), Cadbury Mini Eggs because they look so cute and Hershey Kisses wrapped in the pretty pastel colored foil. Wonder if anyone will be sitting still during church?! The microwaved peeps was a big hit with our kids too-good memories. Always a big cadbury egg with the cream center (cuz I loved them) in their baskets and a VHS movie (back in the day). I never got into the toys for Easter-it was all about the candy. 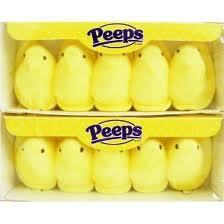 There will be Peeps -- and they will be stale!!! When I was little, my mom would poke a hole in the cellophane, so they would be nice and stale for me Easter morning. That's the way I like them. Out of my 2 kids, only my daughter likes them (and she likes them fresh - bleck! ), my son doesn't like them, but he asks for them anyway, so he can give them to me. What a good son! Besides that, anything goes. My daughter is struggling with this right now because she doesn't want to give her 2 and 3 year old children all that candy. I was really hoping to get some other ideas - anyone do something besides candy? Must haves in our Easter Baskets are a big chocolate bunny (Dove is nice), peanut butter eggs, Peeps of course, Cadbury eggs. When I was a kid, I always got one of those Sugar decorated eggs with the scenes inside. Do they even make them anymore??? I love the black jelly beans but the store that used to sell them went out of business and I can't find them this year! They were licorice flavored. I always put a book or a video or CD in their baskets too (whatever strikes my fancy that year). When they were little they got a new coloring book and crayons or a puzzle. I like just one little thing in there besides the candy to fill the basket up. As for the candy, the rest is like everyone else who commented but Snickers eggs too and Hershey's Cookies and Cream bunnies the last few years now that they're older bz they love them! I don't buy my 7 year old much candy because his grandparents overload him with candy. My mom always buys him Peeps and jelly beans. My inlaws like to buy him Starburst. We like to make s'mores in the microwave with Peeps. And you're right. They do always puff up big and fat before the shrivel down to nothing. It's fun to watch. Peanut butter eggs always. Peeps also, but have never tried the microwave thing....the grandkids are gonna love this!! My friends and I call those eggs "crack eggs". 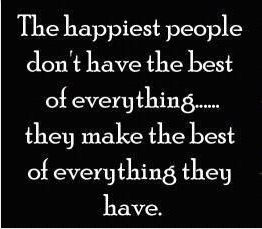 :) We always have those, peeps, and PB eggs. I'll have to try to peeps in the microwave trick.